Mysore and Safari ride in Nagarahole National Park…again – more to come! I am behind on my journaling, but here are some pictures from the weekend. Red Fort – once the most opulent fort and palace of the Moghul Empire. Ceremonial avenue – Rajpath, past the imposing India Gate, Parliament House and the President’s Residence. Beyond the walls outside the Taj Mahal opens a place of wonder on entering the gate to the Taj. We had an English Speaking guide, Monica, who gave us a tour of the Taj Mahal. The Taj is located in Agra in the state of Uttar Pradesh with nearly 5 million visitors a year. The Taj truly is one of the seven wonders of the modern world! It’s beautiful! We entered on the East Gate and went through the Great Gate that frames your first glimpse of the Taj Mahal. The Taj is on 42 acres on the Yamuna river. The Taj took 22 years to construct and about 20,000 unskilled laborers. It was completed in 1651 by using brick covered with marble and sandstone. Within the marble is thousands of precious stones and involves influences of many architectural backgrounds of Central Asia, Indian, Hindu Islamic, Persian and European. The Taj Mahal is a tomb and built from a love story by Mughal emperor Shah Jahan who built it as a tomb for his favorite wife, Arjumand Banu (or known as Mumtaz Mahal). The King, Shah Jahan, decided to build something that would last throughout time and be remembered for his wife. His wife died after giving birth to the 14th child at age 38. The word Taj means “crown”. The Munghals dominated the empire from 16th century to 18ths century. Many of the stones in the Taj came from different surrounding areas, the Lapis Lazuli came from Afganistan, jade from China, coral from Arabia, and rubies from Sri Lanka, and turquoise from Tibet. The white milky marble was hauled 200 miles from Rajasthan. The 144 foot high main dome was constructed of brick covered in an outer dome. 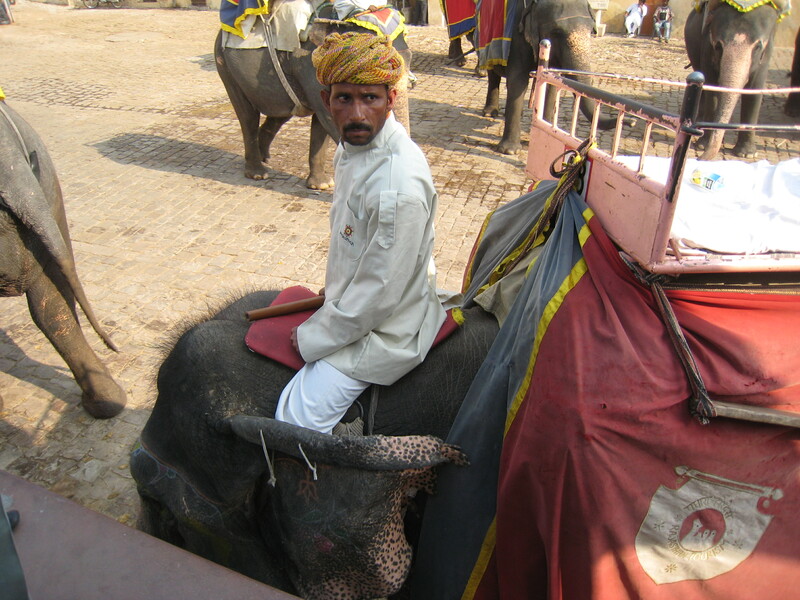 Amber – The Old Capital of the Jaipur Rulers – Elephant Ride from the foot upto the fortress. Palace of Wind (Hawa Mahal), Jai Singh’s Astronomical Observatory and City Palace. Amer Fort is about 11 kilometers outside of Jaipur. It was built by the Meenas King and was built by blending Hindu elements. We rode an elephant up to the top of the fort. Sham our tour guide is pictured above at right. The other rotators and I, Jennifer, Anne, Dominique and Rich are pictured above. Jantar Mantar is one of the largest open air astrological museum in the world. The translation of Jantar Mantar means “calculation instrument”. It is full of sundials, geometric devices for measuring time, tracking the location of the earth as it orbits around the sun. The large sundial can tell the accurate time of Jaipur within 2 seconds of local time. The giant sundial is the world’s largest and is called Samrat Yantra. The Jaipur city palace was built in 1732 and 1739 and was the seat for the Maharaja of Jaipur. The palace continued to be the house of the royal family up until after the Jaipur kingdom became part of the Indian independence (1947). Currently the palace is a museum with the greatest part the royal residence of many of the Maharaja’s of Rajasthan. Fatehpur Sikri is a city built by the Mughal empire. It was the Mughal capital from 1571 – 1585. We also visited the masque inside Fatehpur Sikri, Jama Masjid. Elephant ride up to the top of Amber Palance! Diwali (sometimes spelled differently Deepavali) is the “Festival of Lights”. This year it was October 25 and 26. The main day was October 26 and is set by the Hindu calendar which changes every year since it has fewer days than 365 per year. For Hindus, this is the most important holiday of the year. With speaking with the staff at work, most go home and celebrate with their families. Since many at work are not from Bangalore, they fly home or go by bus, train. They set up many lights in their houses and light off many firecrackers that they say drive away evil spirits. We went to UB City on Diwali night and saw many fireworks throughout the sky light up. The fireworks went on for 3 days- all over the sound was pretty constant. At work on Friday there was a fashion show and contest to decorate their cubicals. Everyone was wearing traditional dress. In the office, they hung up lamps, chalked design in the entryway, and had all the cubes lined at the top with sparkle wreaths. 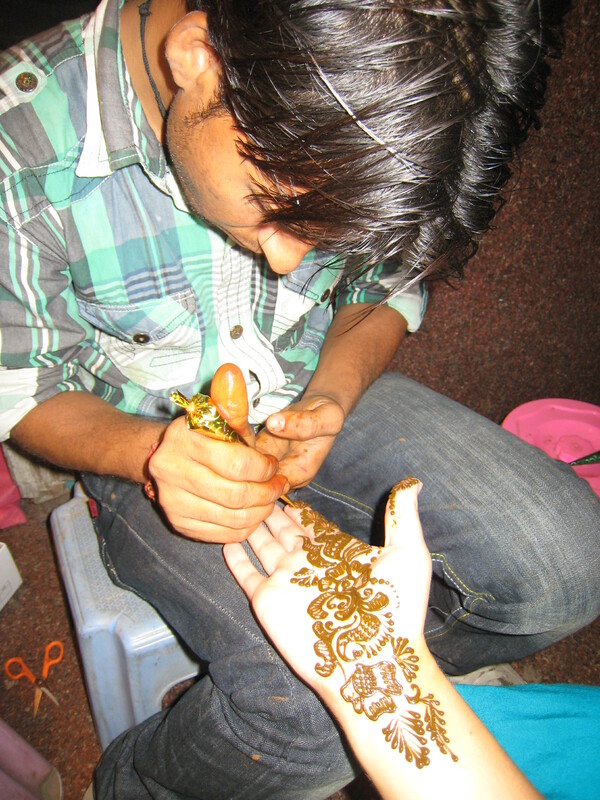 Some of the rotators and I also got Henna done in the streets since it is common decoration for women to do for the holiday similar to Bridal henna. Another popular thing to do is to share sweets! Indians seem to love their sweets! At work they gave each of us a large box of sweets. I tried many of them and a lot were cashew or nut like cookies, fruit cake like bars, etc. 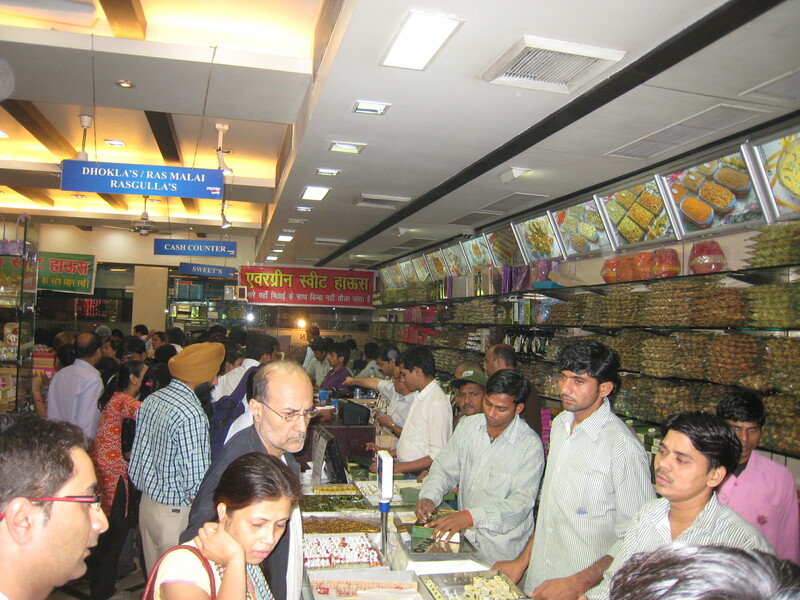 The day before Diwali main night we went to some shops in Delhi and wow was it busy! It was like Macy’s on Black Friday, everyone was buying sweets! For Hindus, each day they worship different gods it sounds and has special meaning on each day. Week 2 at work went well and getting involved on several clients. It’s neat to see different clients from different regions of US and get to work with these teams. I now have several GAMx files and work is pretty busy reviewing the different work and files of the staff and working with various teams. Nights are busy since we have calls with on-shore teams and difficult to get them all in since with Midwest time, we are 10.5 hours behind Bangalore time, makes for busy evenings and leaving around 9 PM. I get in around 9/9:30 so they are long days but go really fast. I have some clients in Pacific, Midwest, and Northeast so is nice getting a variety to see different teams and their approaches etc. It’s difficult to keep all these time zones straight for calls! I also have been set up with several seniors to coach, mentor and meet with them periodically. After work on Thursday we went out to dinner at Sunny’s on 100 feet road. We went with a couple other rotators we met in tax that are here for 6 month rotation. The food was really good and had Mahi Mahi. The fish here has been excellent. I haven’t eaten any beef yet, but not too excited about that since most don’t eat a lot of meat here it’s rare to see it on the menu. Two of the other rotators, Dominique and Jenn, went to Kerala for the weekend. One of the staff at work who is from Kerala set it up for us and planned our trip. We arrived at the Kochi airport and had a driver pick us up (so much easier than backpacking and always figuring out where to go!). Traffic was horrible in Kochi. No joke we landed at 7:00 am and didn’t get to our destination until around 9:30/10 am. 2.5 hour – 3 hours later we had gone just outside the city limits. I am guessing it was around 20 Km we actually went. Since Kochi has a lot of water there are lots of bridges (similar to Florida Keys just more jungle like and not resorts – so I guess nothing alike). Our driver said a bridge was out and the reason for the very slow traffic (basically a stand still for about an hour and half for 1KM). We also hit at a busy time since school here starts at 10:00 AM, was also in the middle of time people going to work and school. School here is 10:00 am – 4:00 pm. 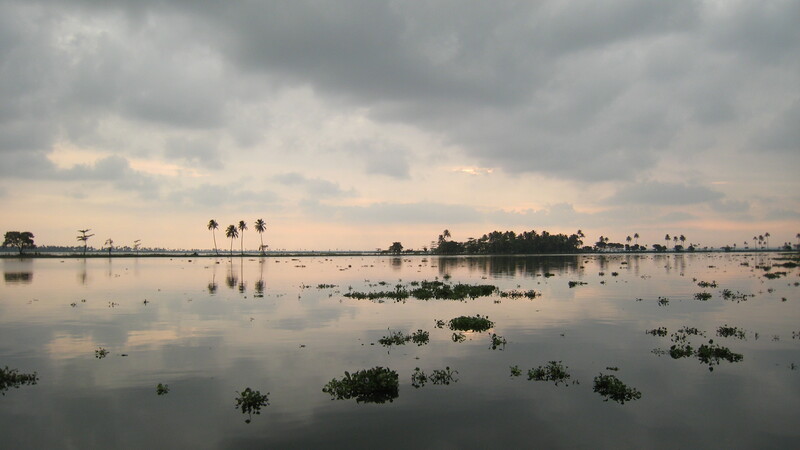 The roads are also very narrow so when driving back to the backwaters where our tour drop off was many winding roads. The street was bustling with school children and was so cute to see them all in their uniforms! After finally getting out of Kochi, and telling our driver we wanted to make a quick stop for water, went to a bakery shop. The girls tried some cookies saying it tasted similar to butter cookies in US. After another 1.5 hour drive we finally arrived at our final destination that was really just like an end of the road where our boathouse came to pick us up. We got on the boat without either the driver or the other crew member saying anything to us. (My guess is they didn’t speak English, and didn’t much.) We soon realized this was a 1 cabin houseboat for the 3 of us with 1 bed (queen size) and 2 pillows. There was a pull out mattress on the floor, but with little lizards and bugs running around wasn’t going to try that out. The crew did warm up to us and said a few words and learned their names. Motur was the owner of the boat and pretty much do this 4 days a week and fish on the other days. We hung out for a while on the boat and soon they brought out lunch. It was delicious! 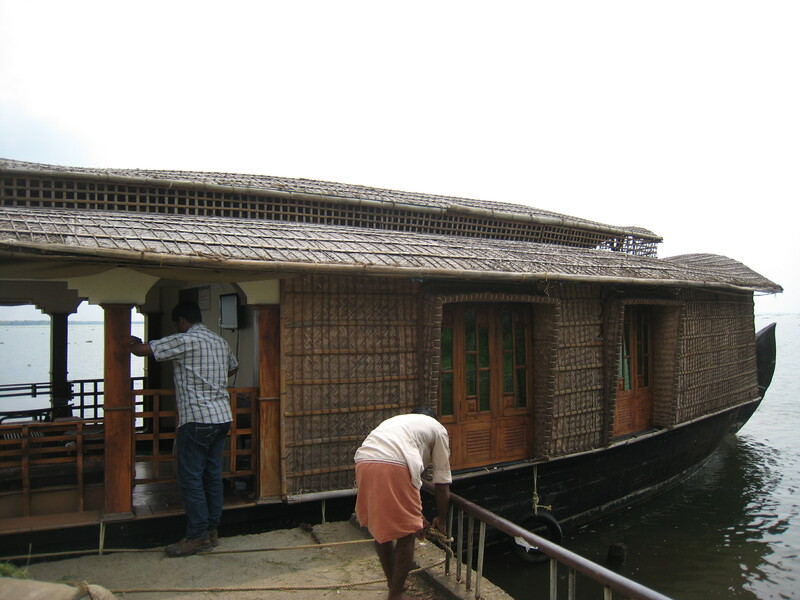 Kerala is known for the fishing with using large Chinese fishing nets as well as the fishing boats in the backwaters. Lunch had a full whitefish on my place – (head included). This was the first time I had a full fish on my plate, but was delicious! Guess I’ve been missing out! We soon also realized that our crew has no alcohol on board. One of the “don’t rules” was avoid alcohol consumption while on board. Oh well- here’s to the next 24 hours of getting to know each other. We each also really didn’t come prepared for basically camping. 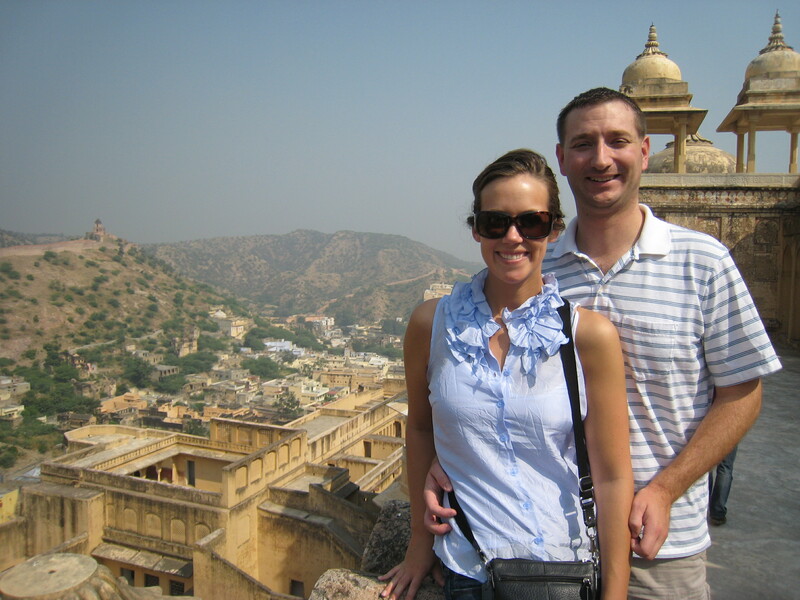 None of us had brought a book to read – but we did have the Rough Guide to India – so that was our reading that we passed around and learned about India. The boat stopped after a little cruise on the canals and we got out and stopped at a little shop. We were hopeful to find some sort of entertainment to keep us occupied on the boat. We found a deck of cards in the shop and bought those. We found what we thought was beer – but bought it and after tasting it didn’t think it was beer and come to find out it was non-alcoholic malt beer. The shop also had huge prawns and a bucket full of crabs (alive). The prawns were literally 4 -5 inches long and the size of lobster tail. 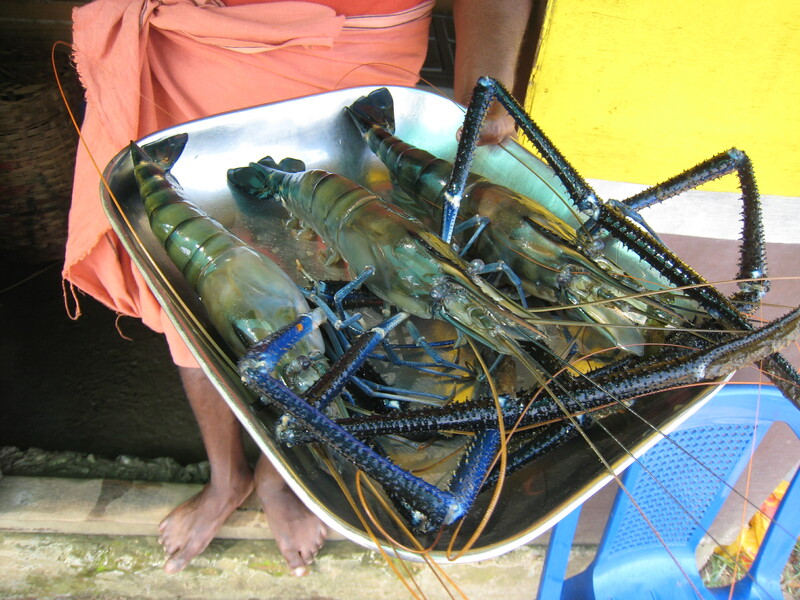 I’ve never seen such huge prawns! The Prawns were huge - probably 6 inches long! The day went fast and had a great time relaxing enjoying the scenery and learning new card games. Dominique taught us a game called Egyptian Rats that we all came to love and was a really simple game similar to Slapjack that kept us occupied. We asked Matur if we could fish and he brought out fishing pole for us and bait. The bait was wheat flour dough that we put on the end of the hook. The hook was pretty simple, basically a stick with a line attached and a hook. None of us caught any fish, but had plenty of bites that took our bait. We saw many fishing boats out and either come out in the morning or evening. Next we traveled to another spot where we would dock for the night. There was also one other houseboat docked there. We were there for a while after a angry man came up and kept untying our boat. He did is several times and was quite comical observing as they were arguing and sounded like we parked over his fish nets. I think he untied us from the tree 5 times and throwing the rope in the water and Matur would re-tie before they finally came to a compromise. 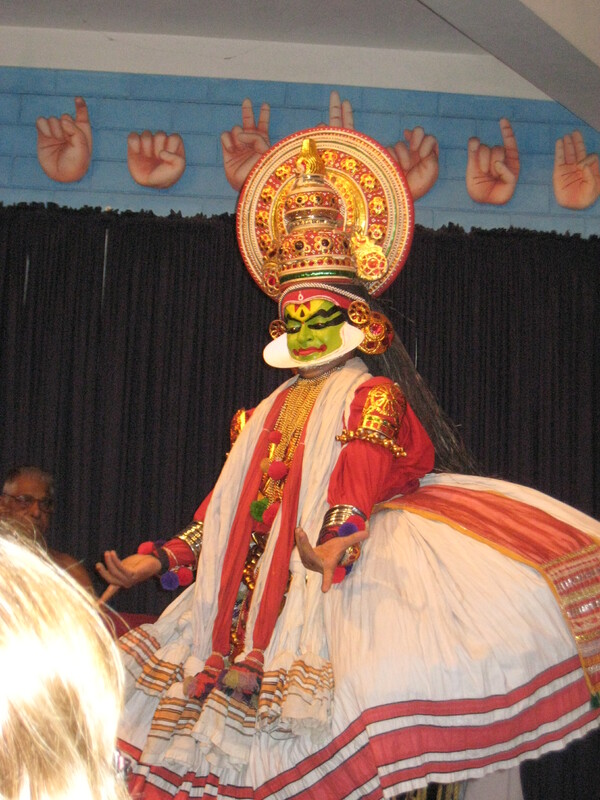 The second day we went to Katakahli story telling dance/ theater show. Saturday I woke up early and did a few things around my room. The hotel has an amazing breakfast with omelets, quiche, bread, cheese, potatoes, bakery items, and really good fruit (and of course complete Indian food bar). A couple of other rotators and I then went shopping for the afternoon to Commercial Street. Commercial Street, Brigade Road, and MG Road are very close and all very good shopping. Commercial Street is more local markets/shops than brand name items. I bought a pair of sandals and love them! Since everyone wears sandals at work, I thought I may get a pair and enjoy not wearing close toed shoes for once. We ate lunch around 4:00 pm; the days here just seem to go so fast! It takes so long to run simple errand or make a stop so I always catch myself at 2 or 3 pm thinking I should eat lunch sometime! We had a quick lunch at KFC. KFC are everywhere here. I had some chicken and of course was a little spicy for their “original”, but was good bite to eat. They also don’t serve with silverware at many places here. I asked at KFC for a fork and of course, no silverware so ate it off the bone. Pizza Hut, Subway, McDonalds, and KFC. Since Indians (Hindu’s) don’t eat beef, the menu at McDonald’s, subway, most places don’t have any beef. No Big Mac, cheeseburger, etc. The South of India especially is mostly vegetarian. At all restaurants that do serve both chicken and Veg, you order from separate lines based on if you want Vegetarian or chicken. Some South Indians also don’t eat certain dairy products (eggs, etc.) or some don’t eat items that grow underneath the ground. Thus, the first South Indian restaurant we ate at had no onions, potatoes, or things that grow in the soil. They said some sort of dirty/spiritual reason on why they don’t eat things from the ground. Also on right on Commercial Street is one of the larger Muslim Masques. While shopping there were 2 prayers/chants that came over the loudspeaker, which to me seemed a little strange for a day shopping at markets. The different religions are so interesting here, since there are also so many different sub-types and has about 10% Christianity, 20% Islam, and 70% Hindu. In Bangalore, the majority are Hindu. 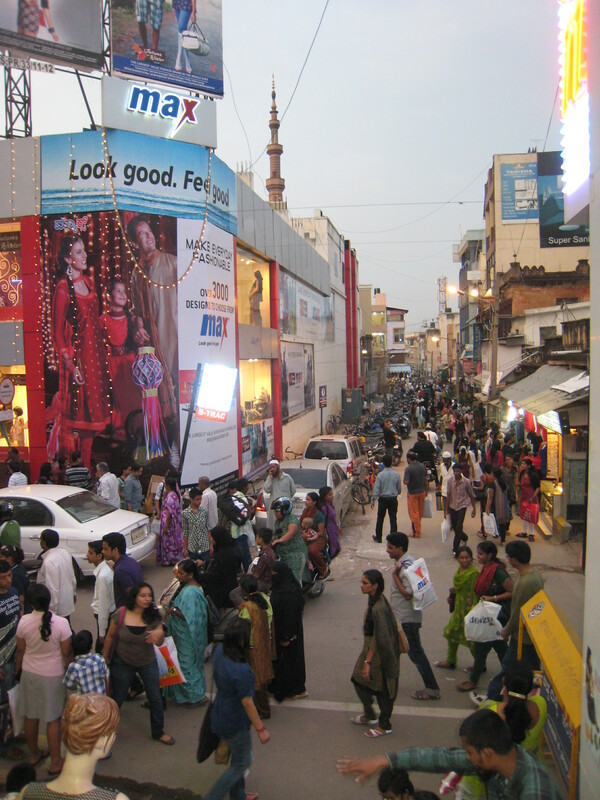 Commercial Street – busy place! 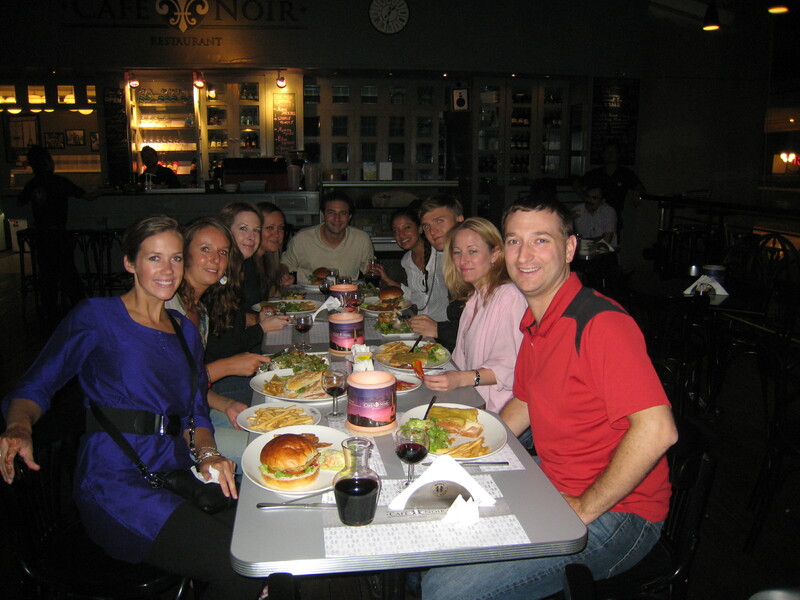 That evening for dinner we went to UB City (United Brewery City) and ate at Tuscany Italian restaurant. I ate some Sea Bass and was really good. UB City has high end designer stores (Louie Vutton, Dior, type shops). They had lots of restaurants up top and a bar at the very top called Sky Bar. We went up to Sky Bar after dinner and were on the top floor overlooking the city. It was a lot of fun, but pretty expensive about $10 US a drink. The music that is played here, the best word that comes to mind is RANDOM. 🙂 One minute it will be Party Rock Anthem and then John Paul or an older song from 10 years ago. All together a great evening and fun bar! Again the bar closed at 11, so not to difficult to close the bars down here. 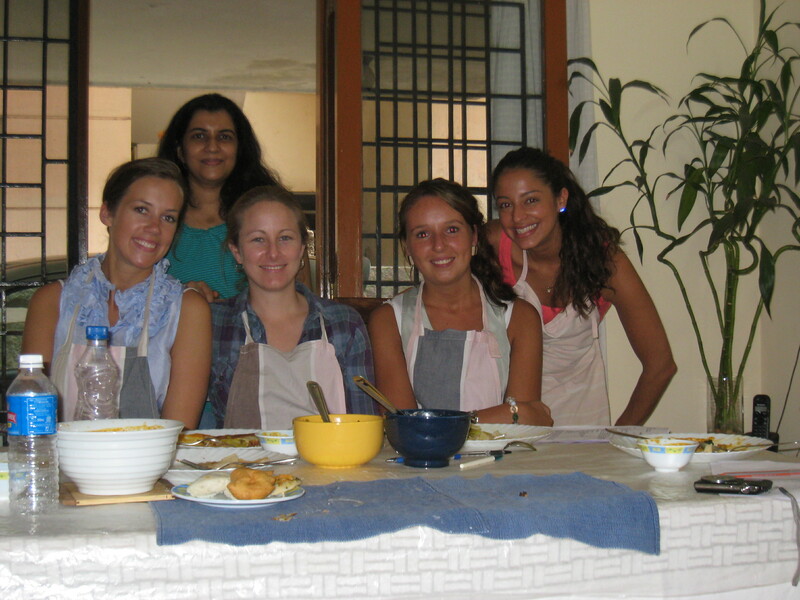 Sunday slept in and took a cooking class for South Indian Food. A woman started this out of her home and has been doing it for about 10 years. Her name is Manju and had excellent food! We made idle, vada, coconut chutney, Masala Dosa (breakfast food), Rada, idlee, Sambar, and many others. It was tasty!! I had the recipes as well – the only thing it may be hard finding some of these spices in the US.